President Obama may in time find it to his — and to his country’s — benefit to fix his gaze not on Ted, but on Jack. For in addition to his more superficial graces, President Kennedy possessed a degree of wisdom, which might be defined as grace of judgment. John Kennedy’s sentiments were liberal, but he knew that a wise president must have the country in his bones, must feel, as by instinct, the temper of the people, and must know what they will bear and what they will not. He was annoyed by those who, like Arthur Schlesinger Jr., urged him to be another FDR. Schlesinger, he said, wanted him to act as if it were 1932. But three decades had passed since 1932; the mood of the people, President Kennedy knew, had changed. President Obama, if he reverences the memory of Ted Kennedy, would do well to eschew his politics. In joining the battle for health-care reform, Obama has entered on what promises to be the climacteric of his presidency. At so critical a juncture he needs to emulate, not the intoxicated extravagances of the late senator, but the sober moderation of his older brother, who knew that the world has indeed changed since 1932. Actually, that’s what I’m afraid of. 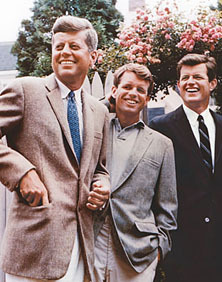 Like Obama, JFK had a charming manner, good judgment, a cool temperament, and liberal instincts. What’s more, as the Cuban Missile Crisis showed, he wasn’t afraid to stand up to his advisors. Obama has all these qualities too, which is why he so often seems like JFK’s political heir. But JFK was also famously cautious, dangerously mainstream on military and national security issues, better able to deliver inspiring speeches than to genuinely move public opinion, and had little sense of how to bend Congress to his will. In the end, he left behind few accomplishments — a fate Obama risks sharing if JFK becomes too much a role model and too little a warning beacon. Sober moderation may have its virtues, but worshipping at its altar isn’t the stuff of great presidencies.